Early science, craft, circle time, game, and activity suggestions created for little birdwatchers. 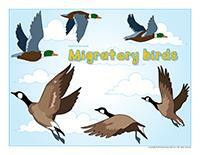 (Open thematic poster-Migratory birds) Print, laminate, and decorate the walls of your daycare with all kinds of posters. 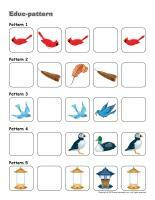 (Open educa-decorate-Migratory birds) Print, laminate, and cut out the various items. Use them to decorate your daycare and set the mood for the theme. Encourage children to make several construction paper birds and hang them from the ceiling in your daycare. Display a map of the world on a wall and use it to show children the route migratory birds travel each year. Transform your circle time area to make it look like a bird's nest. Simply glue bird illustrations on the floor. Add branches and hay and seal everything with adhesive paper. With your group, discuss how birds hatch from an egg. Identify what and how birds eat, learn to fly, and build their nest. Encourage children to pretend they are birds. Let them climb, hop, and spin around. Take advantage of a sunny day and go for a walk. Pay special attention to chirping birds. (Open Poni discovers and presents-Migratory birds) Print, laminate, and cut out the identification cards. Use them to present the different types of birds to your group. If you have a Poni puppet, use it to make your presentation interesting for children. Otherwise, you may use any other puppet you have on hand. Fill a container with feathers and leave it in a corner of your daycare. Children will automatically be drawn to it. Ask children if they have ever been to Florida or down south to begin a discussion about migratory birds. How certain birds do not spend winter up north since they prefer warm weather. How birds travel very far, and never get lost. How birds travel in large groups called flocks and gather in specific locations. How birds make sounds to communicate among themselves when it is time to flock together. How often, birds migrate back and forth between the same locations every year. (Open picture game-Migratory birds) Use the pictures to decorate your daycare or to spark a conversation with your group. Print, laminate, and store the pictures in a Ziploc bag or in your thematic bin. 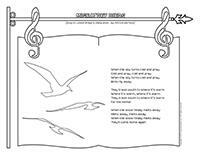 (Open writing activities-Migratory birds) Print for each child or laminate for use with a dry-erase marker. 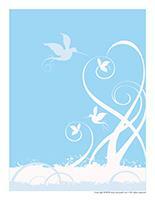 (Open stationery-Migratory birds) Print. Use the stationery to communicate with parents, in your writing corner, or to identify your thematic bins. Drinking straws, connectors, and assembly kits that can be used to build cages. A variety of objects found in the forest (branches, pinecones, etc.). Paper plates to create bird masks. Vibrant paint and pieces of paper. Bird-themed stencils (birds, habitat, nature, etc.). Drawings on which children can glue seeds. The pet shop: bird cages in different sizes, decorative birds, empty birdseed boxes, pictures of different types of birds, birdfeeders, etc. Bird puppets and a theatre. Make your own puppets if you wish! 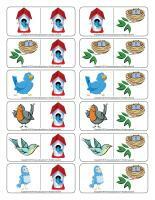 Memory game with bird illustrations (use educatall picture game). Homemade puzzles made with bird illustrations or store-bought puzzles related to the theme. Cards containing bird pictures and numbers that must be associated with the correct number of eggs. Cheerios cereal that can be threaded on a string. Lite-Brite game to create colourful birds. Modeling dough and bird-shaped cookie cutters. Books about birds, birdwatching, and nature. Pictures of birds to decorate the walls of your reading corner (old calendars). Bird sounds that children will enjoy listening to. Bird-related scenes in which children must search for errors. A container filled with different types of birdseed. A container filled with different sizes of plastic eggs. A container filled with sunflower seeds or mixed birdseed along with containers children can use to measure, fill, and pour. A birdwatching station complete with binoculars children can use to observe the birds that visit your yard. Use the flashcards to spark a conversation with your group, in your reading and writing corner, or to identify your thematic bins. 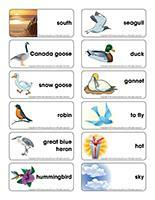 (Open word flashcards-Migratory birds) Print. south, Canada goose, snow goose, robin, great blue heron, hummingbird, seagull, duck, gannet, to fly, hot, sky. 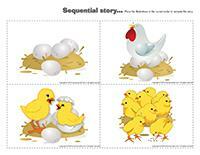 (Open sequential story-Birds) Print, laminate, and cut out the illustrations. Encourage children to place them in the correct order to recreate the story. With younger children, use fewer illustrations. Like migratory birds, flap your "wings" to move around the daycare. Teach children facts related to different types of birds. For example, they can flap their wings very quickly to represent a hummingbird, make large sweeping movements to represent a great blue heron, etc. During transitions, provide a large container filled with colourful feathers and invite children to sort them according to their color. You will need a tree branch. Use heavy rope to hang it horizontally from your daycare ceiling. Hang decorative birds, birdhouses, etc. from the branch. Display pictures of birds on the walls of your daycare and next to your changing table. Secure other pictures on the floor using adhesive paper. Old calendars can represent a great source for pretty pictures. Assemble several bird pictures to form a mobile. Hang it over your changing table so children can observe it during diaper changes. Add a large quantity of feathers to a tiny bin. Play fast-paced music and encourage children to toss the feathers up in the air. Use the feathers to tickle little ones and encourage them to tickle you too. While you are out for a walk or simply playing in your yard, listen closely to the sounds produced by birds. If you prefer, purchase a CD containing nature sounds or borrow one from your local library. Pretend to fly around the daycare like birds. You can practice flying slowly, quickly, rest on a branch, hop around, etc. One child plays the role of the bird while the other children are worms. The bird must try to catch all the worms to prepare his/her meal. Outside, draw a few large circles with sidewalk chalk. If there are 6 children in your group, draw 5 circles. Select one child to be the bird that does not have a nest. All the other children are in their nest (one of the circles). When the child says, "I am looking for a nest," all the other children must leave their circle and try to find another one. There will always be one child left without a nest. If you wish to do this activity indoors, use electrical tape to draw nests on the floor. Invite children to stand on one leg and see who can hold this position the longest. Arrange the picture game illustrations on a table, face down. Invite one child to pick a card. He/she mustn't show the picture to the other children. The other children must ask him/her questions to try and discover which bird is shown on the card. The child holding the card can only answer using "yes" or "no". Variation: If the children in your group are too young to recognize the different types of birds, add pictures of other animals and have them determine whether the child who picked a card is holding a bird or not. Set a feather in each child's hand and have them blow on it to send it flying through the air. Have children sit in a circle. Every time you say, "Birds can fly," children must pretend to flap their wings. Mention different animal actions before repeating this key sentence. Children must therefore listen closely to know when to flap their "wings". Teach children how to whistle. They will enjoy practicing throughout the day. If you are really brave, you can use soda crackers to teach them the basics at snack time. Set your parachute on the floor and deposit several feathers on it. Invite children to hold the edges of the parachute to shake it ever so gently at first. After a while, tell them to shake it much harder to send the feathers flying through the air. Take advantage of sunny days to take your group outside to listen to the birds and observe them. Encourage children to climb, hop, and spin around to create their own bird dance. Invite parents to join you on a trip to a nearby bird sanctuary or zoo. Organize an outing to a nearby forest to provide children with birdwatching opportunities. 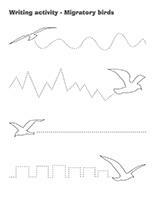 (Open educ-math-Migratory birds) Print and laminate for durable, eco-friendly use. Children must count the objects in each rectangle and circle the corresponding number. 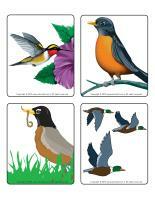 (Open educ-same and different-Migratory birds) Print and laminate for durable, eco-friendly use. Chidlren must circle the illustration that is different in each row. 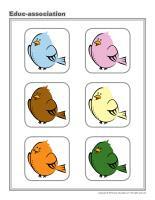 (Open educ-same and different-Birds) Print and laminate for durable, eco-friendly use. Children must circle the illustration that is different in each row. 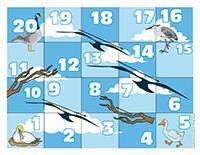 (Open snakes and ladders-Migratory birds) Print and laminate. Use a die and playing pieces. The object of the game is for each child to reach the last square on the board game. When they succeed, encourage them to fly around the daycare before returning to their spot to watch the others complete the game. 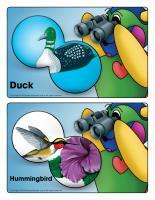 (Open magnifying glass game-Birds) Print and laminate the board game and the cards. Cut the cards and store them in a box or Ziploc bag. Children take turns picking a card and searching for the illustrated item on the board game using a magnifying glass. When they find the corresponding illustration, they must deposit it in the correct square, on the board game. 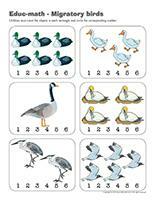 (Open educ-association-Birds) Print and assemble the association game in a file folder. Children must associate the illustrations. When they find a match, they must deposit it in the corresponding square using Velcro or adhesive putty. (Open hunt and seek-Birds) Print and laminate. Children take turns picking a card and searching for the corresponding items in the scene. (Open educ-pattern-Birds) Print and laminate. Children must use the cards to complete the patterns by arranging them in the correct squares using Velcro or adhesive putty. (Open dominoes-Birds) Print, glue the cards on heavy cardboard, and laminate. This game is for 2 to 4 players. Each player picks 5 cards. Arrange the other cards in a pile on the table. Place one card. The first player must try to place one of his cards containing a matching illustration next to it. If a player does not have a matching illustration in his/her hands, he/she must pick another card. If he/she still cannot play, his/her turn is over. The next player must then try to match one of his/her illustrations to one of the illustrations at the end of the path created on the table. The first player to place all his/her cards wins. 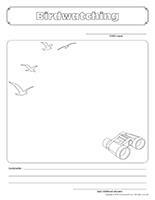 (Open scrapbook-Migratory birds) Print this new page for each child. Have each child draw his/her favorite bird species. Help children add this page to their scrapbook. If you do not already have scrapbooks, visit the Scrapbook section in the educatall club. Have children write or draw a special message for one of their friends. When they are done, encourage them to deliver it, pretending to be carrier pigeons. Let children draw or write using feathers dipped in ink or poster paint diluted with a small amount of water. Provide binoculars and encourage children to observe birds through a window in your daycare. When you are outside, invite children to search for feathers. Set a plastic tablecloth on a table. Let children use mud to form a nest. Have them collect branches, leaves, etc. They can use them to complete their nest. Let dry and show parents your project at the end of the day. Use feathers instead of paintbrushes to paint bright designs with your group. Provide several old calendars or old magazines containing pictures of birds. Use them to create an original picture book with your group. (Open models-Migratory birds) Print for each child. 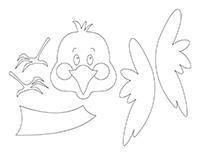 Invite children to color the birds and cut them out. 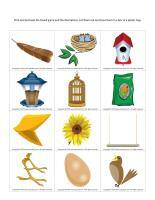 Use the birds to create a mobile or simply display them on the walls of your daycare. For each child, cut two holes out of a brown paper bag to represent eyes. Let children decorate their bag to make it look like a bird. Provide markers, feathers, and colourful scraps of paper. (Open bird shapes) Print for each child (ideally on cardboard). Deposit birdseed on the table. Have children apply white glue all over the shapes and then press seeds on them. Let dry and display. Draw a forest scene on a large paper banner with your group. When your forest is ready, invite children to cut birds out of magazines and glue them among the trees. (Opens masks-Birds) Print. Set a large pile of feathers in the centre of the table. Give each child a paper plate in which you've already cut two holes for the eyes. Using scissors, markers, and glue, children decorate the contour of the eyes and add a beak before sticking feathers all over their plate. Attach a string behind each mask so they can be tied behind their head. (Open 3D bird) Print and cut out the various pieces. Glue multicoloured feathers all over an empty toilet paper roll and then add the bird parts. Hang the birds from the ceiling. 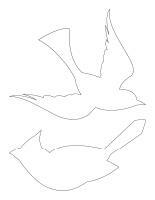 Trace a bird shape on a piece of clear adhesive paper. Provide feathers, tissue paper, and confetti children can use to fill the bird shape. When they are done, add another piece of clear adhesive paper on top and display the bird in a sunny window. This craft can be done individually or represent a group project. Provide different types of feathers and encourage children to use them as paintbrushes with poster paint or watercolours on large pieces of paper. 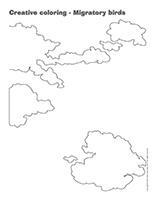 Give each child a bird-themed coloring page and have them trace the outline of the shapes with white glue. Sprinkle sunflower seeds (or another type of seed) on the drawing, shake off any excess seeds, and set aside to dry. Give each child a coffee filter and have them glue Easter straw all over it to create a cute nest. Add construction paper birds. Invite each child to create a unique bird using a specific type of material: modeling dough, salt dough, feathers, buttons, pipe cleaners, glitter, pieces of cardboard, tissue paper, etc. Collect tree branches with the children in your group. Let them paint the branches with a mixture of poster paint and glitter or use the branches as paintbrushes by dipping them in paint and using them to draw lines on construction paper. Punch holes at the top of the container. Thread a string through the holes so you can hang the birdfeeder from a branch. Cut a large door on one side of the milk carton. Decorate the birdfeeder and pour mixed birdseed inside. Cut the milk carton halfway up. Keep only the bottom section. Decorate it and pour birdseed inside. To hang your birdfeeder from a branch, make holes on either side and thread a piece of string through the holes. Inflate a balloon and knot the end. Glue a construction paper beak near the knotted end. Have children cut bird feet out of cardboard and glue them under the balloon. Add eyes and feathers. Use two empty toilet paper rolls per child. Have them decorate them and glue them side by side. Make a tiny hole on either side of their binoculars and thread a string through them. Children will love wearing their binoculars around their neck so they have them on hand to observe birds. 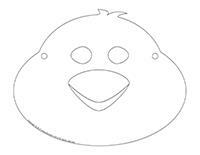 (Open models-Birds) Children must first cut out a bird shape and decorate it as they wish. Provide different arts & craft materials (including feathers) children can use to complete their creations. Hang the birds throughout your daycare. 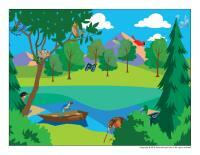 (Open creative coloring-Migratory birds) Print for each child. 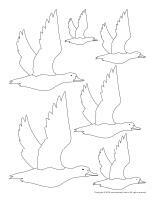 (Open coloring pages theme-Migratory birds) Print.